As promised, 2014 will be full of editorials and one of my main goals was to really focus on beauty and grooming retail, and so #RetailFocus was born and this one’s a doozy. I’ve waited over a week to write this, in all honesty, to calm down. 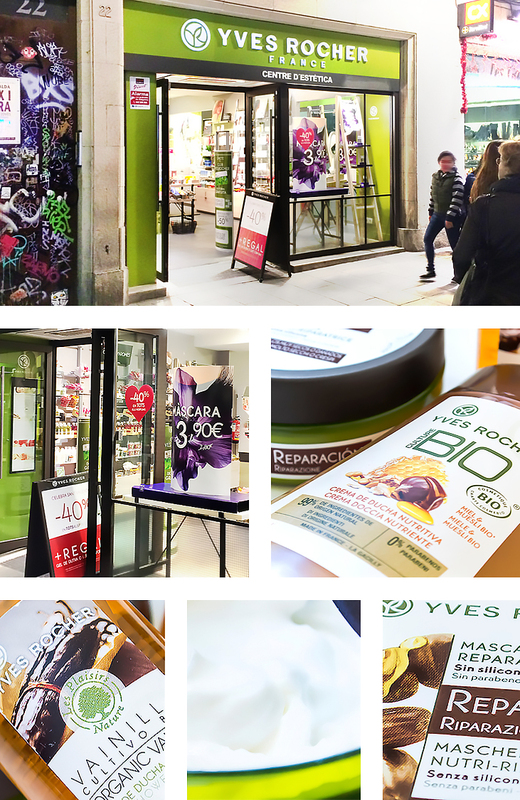 Yves Rocher has been in my peripheral vision for a few years and although I’ve never seen a store in the UK, I’ve seen them quite a bit here in Spain (they got a mention in my latest YouTube video). Yves Rocher, a real, live human being, was a French businessman and founder of the cosmetics company that bears his name, founded in 1959. He was a pioneer of the modern use of natural ingredients in cosmetics. The company is present in 88 countries on five continents and employs 13,500 personnel, excluding more than 215,000 employed through additional, indirect jobs. I’d gone in to my nearest store on Portaferrissa, just off La Rambla in Barcelona (I’m out here working mobile until March), for something in particular. A commenter on YouTube had recommended I get hold of the Jardins du Mond Brazilian Coffee Shower Cream. On entering the store, I noticed how clean, vibrant and well set out it was. It reminds me of how new The Body Shop stores are laid out with buckets, racks and a plethora of point of sale displays, each vying for your attention. The doors open straight onto the street and the whole environment was very inviting. The store was empty and I approached the till where 3 female store assistants were behind the counter crowded around either a rota or daily sales sheet pinned to a clipboard. I made a gentle throat clear that was easily audible and was promptly ignored. I waited for around 30 seconds which in this circumstance was an uncomfortably lengthy amount of time before I politely but firmly asked “Excuse me..?” (Spanish is my second language and the whole visit was conducted in Spanish but it seems pointless to parallel translate it here!). One of the women looked up at me whilst the other two remained transfixed on the sheet and with the sourest ‘how dare you disturb me’ look uttered “Yes?”. This is the kind of bullcrap customer service that gives the industry a bad name and is the reason men don’t shop or feel welcome in this kind of store environment. I told her that I was looking for a particular product to which she informed me that they don’t have it in stock; at the same time the other two consultants looked up and began to stare at me during this brief conversation as if I’d pulled down my pants and peed on the floor. When I said “oh ok, not a problem!” purposely not moving away or looking like I’d finished, they resumed looking at this magical piece of paper. No hint of “but we do stock this that you might quite like…” Zilch. Nada. Well I thought “bugger this, I’m already here” so I had a nosey around the store. The products are low priced but seem very high quality, conveniently arranged and pretty self explanatory – lucky considering the service standards. I wanted to buy a non-drying shower gel and also a hair mask, as after only a week and using Aveda Invati, the mineral rich water of the city centre had dried my hair to a frizzy crisp (no surprise that hair masks are big business here in Spain). As I was browsing, two separate, older Spanish women entered the store; the staff were all over them like a rash, delivering advice, demonstrations and sharing product knowledge. Even though I was now in the hair section, I was still being ignored despite making very obvious body language whilst holding a product in my hand that screamed “I want some help and advice please!”. Nothing. Ah well. There also seemed to be a big promotion in store with certain items being marked down and some signs hinting at free gifts and such; nothing was mentioned to me. After selecting three products totalling €10.65, I made my way to the till. I was immediately pounced on by a member of staff at the till, who seeing that I was making a pretty OK purchase, was ever so keen to tell me about their loyalty card. For research purposes, I should have let her continue, but I was so annoyed (and probably should have just left the store to begin with) that I just quietly replied “I don’t think so, do you?” to which she nervously smiled and asked me to join the queue behind one other customer. I was served promptly and efficiently. Even though gift wrapping services seemed to be available (of which they are in almost every store in Spain) and it was 2 days before Valentine’s Day, I was surprised gift options weren’t mentioned. They were also out of bags, which I can’t really hold against them and she did offer me a clear, plastic zip-lock bag (for travelling). I smiled at her and the miserable crack in her face seemed to widen slightly, and, to her credit, she did pop some little sample sachets in with my receipt which were however, chosen completely at random and nothing to do with my purchase (it’s always wise to deliver ‘smart sampling’). I left feeling furious but simultaneously excited with my purchases. I will be reviewing the products bought this week as I’ve really been enjoying them. I bought the Botanical Hair Care Nutri-Repair Mask, Mini Organic Vanilla Shower Gel and Bio Nutri Nourishing Honey Shower Gel. So in conclusion, fabulous store, fabulous products, horrible staff and a seemingly complete lack of customer service. This particular store also had a spa/centre d’esthetique at the back and after this experience, it’s the last place I’d want to go and relax. I will most likely shop online before considering returning to an Yves Rocher store again. This article first appeared on MANFACE written by Thom Watson. It was published on Monday 24th February 2014 and was last updated on Monday 3rd April 2017 at 2:11pm. It's categorised under Yves Rocher where you'll find more related content. Arghh that makes me mad when consultants don’t treat you like a woman, luckily I haven’t been ignored recently! I think I ran into a Yves Rocher in Spain or something very similar.